Customer Relationship Management (CRM), as the name suggests, is primarily a customer-centric tool. But, it does have a multi-pronged effect on key business functions, proving to be the catalyst in organically evolving and optimizing retail planning and processes. Retail CRM helps retailers service, retain and grow their customer base. Loyalty programs: Global reports have shown that retailers can raise profits by 75% by retaining just 5% of the current customer-base. So, loyalty programs, if effectually planned and sustained, can be a substantial growth driving tool within the business. These programs can be planned to stay nimble as per the business objectives – to acquire more customers and make them stick, to increase transaction value from current base and to cultivate brand loyalty as a prestige token through preferential treatment. 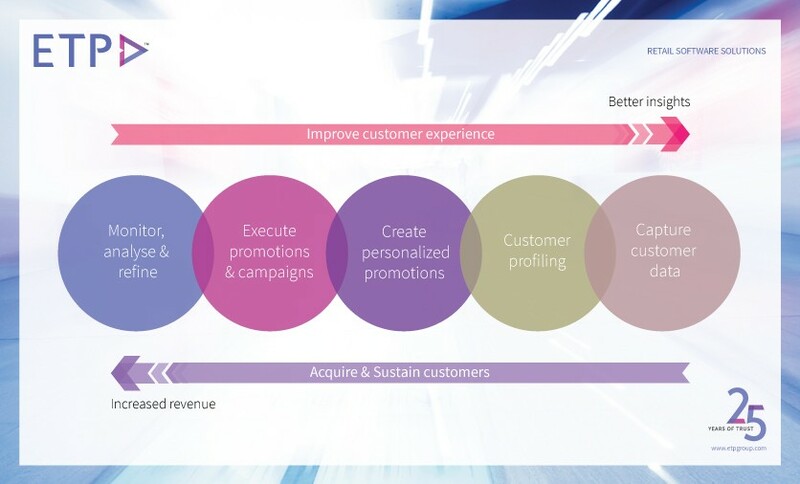 Promotions: CRM based metrics help retailers evaluate their marketing campaigns and promotions. It applies the base of a seamless rewards and recognition program that can be automated and promoted through multiple channels. Determining the right channels for the promotions forms part of the strategy which can be allocated as per promotion phase, budget or target demographics. The promotions can be analyzed real-time to be revised or reinforced, basis customer feedback. Personalized Offerings: This is perhaps the most significant part of retail CRM technology, albeit used inadequately, due to high dependency on external factors like trained staff, complete stock visibility, back-end system integration with real-time CRM information, etc. If these dependencies are adequately resolved, the retailer can break down his customer data and identify servicing factors which distinguish him from the competition. He can understand the product, payment, timing preferences and demographic details based on location, age, gender, race, etc. This information is worth its weight in gold, if employed successfully and executed perfectly towards providing superior shopping experiences. While increasing the demand side of the business remains sacrosanct, the course of action to achieve the same is subject to further correction. Most retailers reward the wrong customers and deprive the right ones by presenting equal or average service value to both. With a powerful Retail CRM Software integrated across all operations, the retailers can have a 360° view of all business functions such as Omni-Channel and E-commerce, intuitive POS, Mobility, Daily Reports & Analytics, Social Media, Customer Support, Loyalty Programs, Promotions and Marketing Campaigns, which hold the potential to creating the desired demand from the right customer community. At the same time, the customers’ expectations for a more delightful and better rewarding, personable experience and value will only increase through their consumption cycle with a retailer, making the transaction of knowledge and experience a two-way street. Emerging technology is making it possible for retailers to match performance with desired pace in all channels across the globe. Cloud computing and marketing ensures that the process data shows the ‘one version of truth’ with real-time ease. Mobility in-store and online applications further provide the convenience and incentive to simply click, choose and buy. Through a powerful and engaging social media connect, brands can capture the most coveted real estate in retail – the customer’s mind. All these technological measures help improve the shopping experience, increase the brand equity and also keep feeding additional data to the CRM solution equipping it with the ability to harness potential with strategic speed. The above points illustrate how CRM is a comprehensive tool, which can be used to not just grow the business but also to support it to stay competitive, apply sharper focus and merge the art of customer engagement with the science of derived business value.